1. The figures provided above are indicative and were derived from the Medisave contribution schedule made available on the CPF Board website. These supplied figures are also largely relevant to individuals hailing from other self-employed professions (sole-proprietors, hawkers, taxi-drivers etc). 2. The age of the contributing individual is defined as that at 1 January 2016. 3. Medisave contribution schedules are subjected to changes at the discretion of the relevant authorities. It is strongly advised that the individual consult the CPF Board website for the latest updates. 4.Arrangements can be made to fulfil one's Medisave contribution via a GIRO installment payment plan. 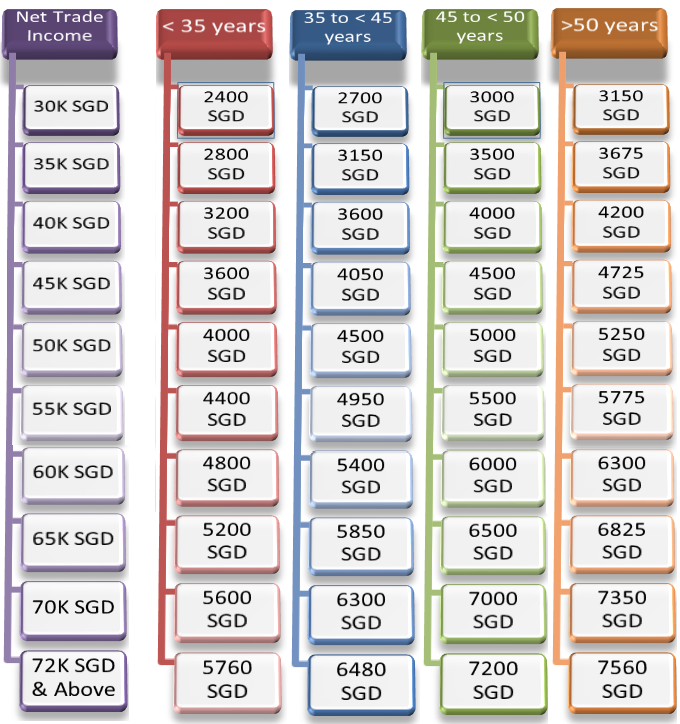 Say for example, if a 48 year old private tutor is required to contribute 7200 SGD based on a net taxable income of 72,000 SGD, he can set aside 7200/12 =600 SGD per month to meet his minimum contribution requirements. 5.The current Medisave contribution ceiling stands at 49,800 SGD. Whilst filing tax returns next year, ie 2017, tax reliefs can be claimed for current contributions.